Juventus got the better of Napoli in a feisty encounter at the San Paolo. The victory saw the Turin based outfit stretch their lead at the perch to 16 points. The game started off frantically with the home side enjoying the better of the early exchanges. The away side couldn’t contend with the hosts’ movement off the ball and their high pressing. However, the match turned pear-shaped for Napoli in the 25th minute when their keeper Alex Meret was issued a straight red card for preventing Cristiano Ronaldo a clear goal-scoring opportunity. The visitors took the lead from the resulting free kick with Miralem Pjanic deliciously curling the ball over the wall and beyond the reach of substitute keeper, David Ospina. In the 39th minute, the Old Lady doubled their lead as an unmarked Emre Can headed home from a Federico Bernardeschi cross. With an extra man on the pitch, Juventus was expected to come through unscathed in the second period. However, a red card for Pjanic two minutes after the restart shifted the momentum. Napoli turned the screw and were rewarded just after the hour mark when Jose Callejon smashed the ball into the roof of the net. Yet, the hosts were unable to breach the visitors’ rear-guard thereafter and were left ruing their missed chances. The game at the San Paolo on Sunday pitted the Serie A’s top two teams against each other. However, many expected Juventus to exert their dominance over their second-placed rivals. The match took a turn for the better for them just after a quarter of the game as Napoli were reduced to ten men. Prior to the sending off, Napoli had controlled proceedings and looked capable of unlocking Juventus’ defense. Yet, with numerical superiority, the latter made the former pay with two quick goals. The first was scored from the free-kick which succeeded the red card whereas the second was scored a few minutes later. 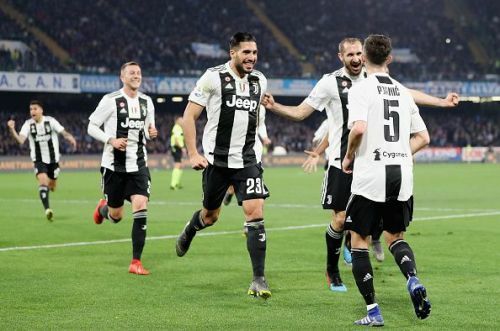 The goals pinned Napoli back and even though the home side tried to attack Juventus at all times, they were forced to retreat on occasions due to their numerical inferiority. In hindsight, the importance of the two times they made the net bulge couldn’t be overstated enough as Juventus themselves had a man sent off in the second period. The game at the San Paolo was a see-saw affair with Napoli unwilling to go away without a fight. Luckily for the Old Lady, they ensured the job was done before the push came to shove.